Which turned out to be little red tree ants. The list is memorable meals, not memorable dishes..... hey, that could be another list! 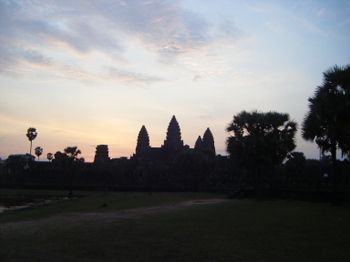 And there were those stories, like the young lady in Siem Reap named Akin, who came to work in the city at the age of 9! Akin, an orphan who never knew her parents nor siblings, felt the need to comfort us when we were so touched and distressed by her story by sharing with us her philosophy on life: "no worries, no worries, I'm Happy-Happy every day!" 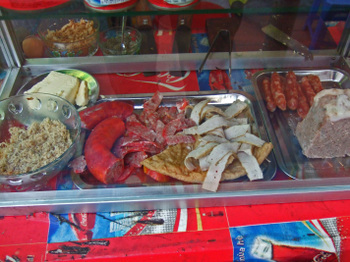 And since it's meals, not drink, I need to exclude the Chicha de Jora from a dirt-floored roadside shack in Calca. Frothy, yeasty, and light, it's a wonderful beverage. 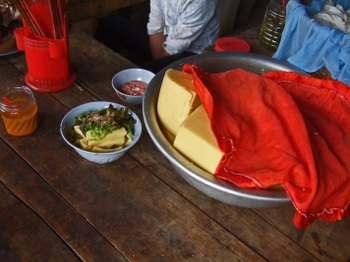 There's just one thing you need to understand about Chicha de Jora, to quote: "In order to start the fermentation process, the maize is moistened in the maker's mouth.....the digestive enzymes in saliva helps to break down the starches and start the fermentation process. 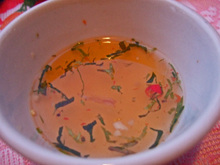 In fact, it is thought that the modern name for this drink is based on the Spanish word "chichal", which means to spit". After all, if it comes out of a rusty old barrel, through a bamboo tube, it's gotta be good, right? Hmmmm..... another list! I'll stop now, and leave this list for later. But I'm wondering, how many of you have been reading for the last four years or so. And if you have.... first I'd like to thank you so much for reading! Second, are there any posts which stand out in your mind.... or perhaps you'd like to take a stab at what you think were our most memorable meals? 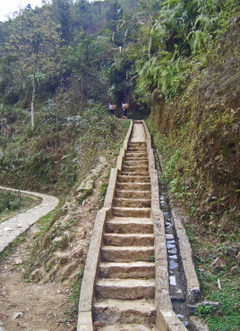 On our last morning in Sapa, still feeling the jet lag, we rose early, and the Missus decided that She wanted to take a "short hike" down to the waterfalls near Cat Cat Village. 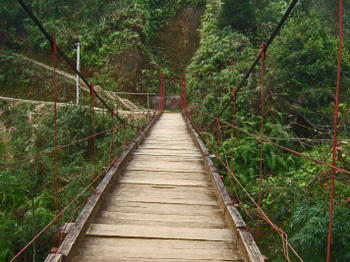 With our last "short hike" still fresh in my mind, I was a bit hesitant. But this turned out to not be too bad. 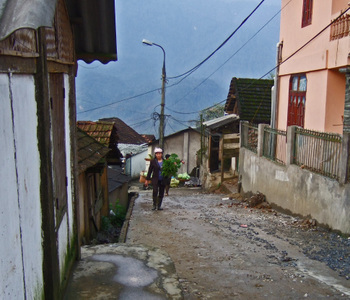 To reach the trail down to Cat Cat Village, you walk through the Sapa Market, and down the road. The early morning view of the misty valley is breathtaking. After paying admission at the entry booth, you start heading down the well paved road. Young Xe Om drivers stop as you head down the hill, each one lobbying for the ride back up the hill. "Mister, I'm Coca-cola(tugging his coke hat), you remember me for later ok?" "I'm Lucky Strike(showing me his lucky strike T-shirt), maybe I give you ride back. You remember me ok?" And so forth. Luckily, we arrived early, and the cool morning air made everything much more pleasant. 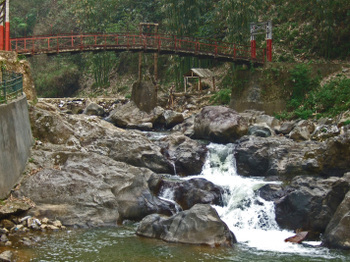 Instead of heading through Cat Cat Village we just stayed on the main road, eventually crossing this bridge. There are two or three different trails that lead around the hills. 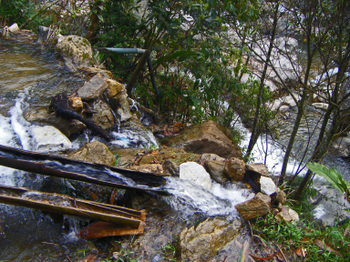 After passing several fields growing Indigo plants, we ended up at the falls, and the bridge that crosses the river. It's a nice place to take a break. If we headed across the bridge, we'd have looped through Cat Cat Village. Weary of the "hard sell" we decided to turn around and head back. We were lucky to have had an early start. We passed large groups of tourists making their way down the road. It was a nice little morning hike. Famished from our morning walk, we noticed a quaint looking little shop just down the street from the hotel. 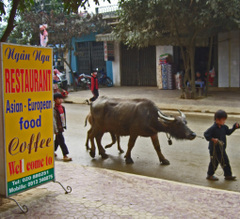 This was in the opposite direction of most of the businesses in Sapa, so the street was a bit quieter. 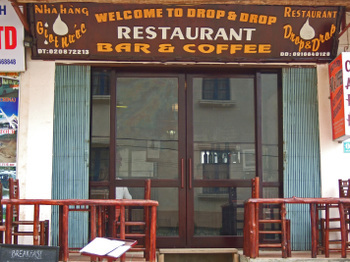 The place was called Drop & Drop Restaurant. We walked in and had a seat. When it came to ordering, the Missus still wanted more vegetables. So we started with the Mixed Vegetables(10,000 VND - about 60 cents/US). 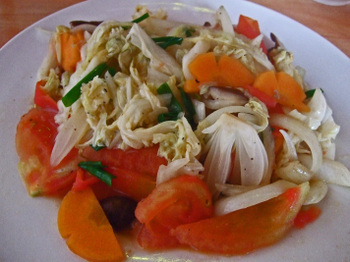 For this price we hadn't expected much, and this was just a basic stir fry of onions, cabbage, carrots, and tomatoes. Light soy sauce and black pepper flavor, the tomatoes were very good. 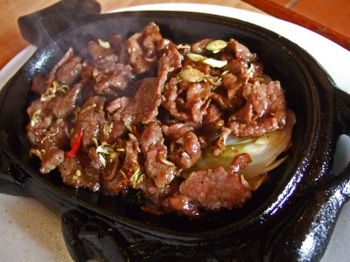 The dish arrived on a sizzling plate, well seasoned, and pretty tender. The meat had a good beefy flavor, and was much better than I thought it would be. The story of the next dish was interesting. 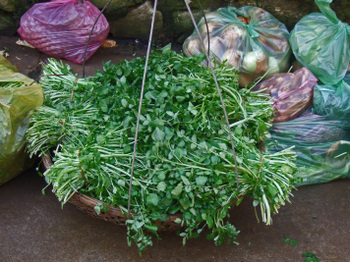 I recalled seeing the wonderful watercress in the Sapa Market, and was happy to see stir fried watercress on the menu. When I ordered it, the Young Lady took a long pause, and looked at us, and said; "okay, we can do that!" 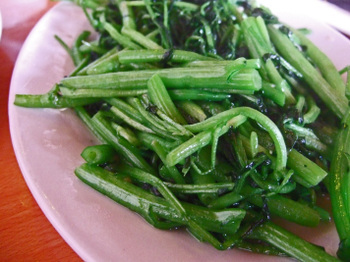 While we were eating our stir-fried vegetables, a Girl entered the restaurant carrying a bundle of fresh green watercress, which was stir fried, and made its way to our table a few minutes later. Fresh, crisp, slightly bitter, with a hint of sweetness this was quite good (16,000 VND - $1). Now it gets a bit strange. 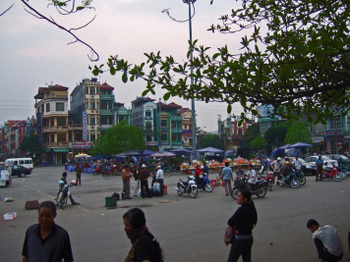 We arrive at Lao Cai, but instead of stopping at the Train Station, we stop in front of a restaurant. The Driver gets out and announces, "okay, everybody, you stop here and eat before you get on train." Huh? 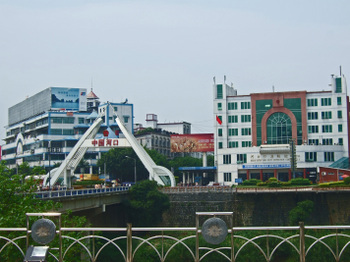 Not getting a good explanation as to what was going on and unable to get any information, we crossed the street, and walked over to Lao Cai Station. We knew we had to exchange our tickets for boarding passes, but where was the question of the day. As we head to the train station, we see the "Guy with 3 wives" sitting with a young lady at one of the juice stalls in front of the train station. So I ask very innocently, "Is this your wife?" And he gives me a weird look and say, "no, no, we are not married." I dunno, working on wife #4 perhaps? After asking around a bit, the Missus figures out where we exchange our tickets. We had to go 2 blocks from the train station, into another restaurant, and up to the second floor to a desk to exchange our tickets for boarding passes. I'd say they've got a bit of a racket going. 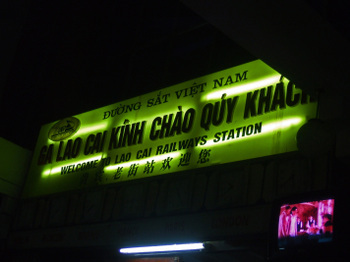 Soon after sunset, our train was called, and the huge mass of humanity boarded the train. Just as on our train ride to Sapa, we thanked Beach for making sure we had an entire 4 berth to ourselves. Not much sleep tonight, but lots of excitement. 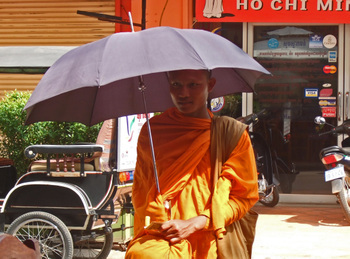 Tomorrow night we'd be in Siem Reap! As I started typing this up, the Missus peered over my shoulder; "no, not another market!" She: "Just how many markets are you going to do posts on?" Me: "All of the markets we visited." She: "I am soooo over all these market posts." Sigh, so yes, it is but another market post. 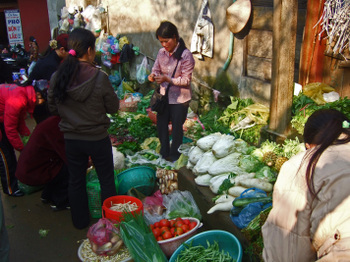 I believe that each market we visited had it's own personality, and told me much about the towns, villages, and cities we visited. 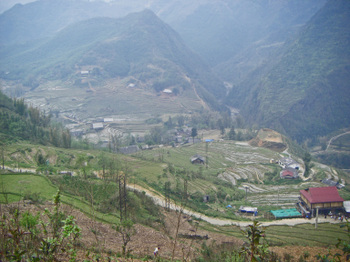 Cho Sapa was no different. It may have been smaller than all the others we visited, but I learned a bit. 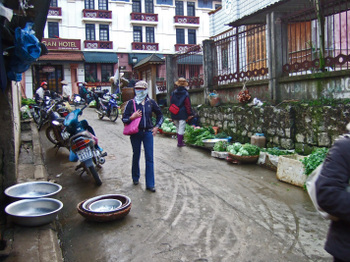 The Sapa Market is located right off the main street down a set of crowded slippery steps, or the down the alleyway lined with produce a block further. 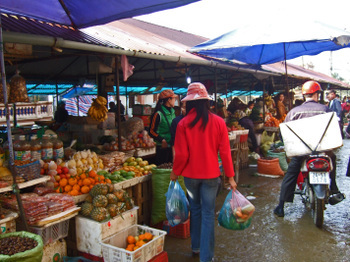 And though the market has a nice section of fruit. We noticed most of it was being unloaded from large trucks early in the morning, coming from elsewhere. It was the sparkling fresh vegetables that really caught our attention. 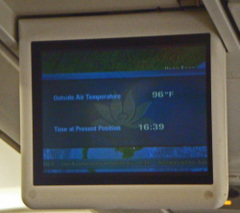 In spite of the fact that we had already spent over a week in Vietnam, our internal clocks were still off kilter. But one of the benefits of jet lag, was rising early. 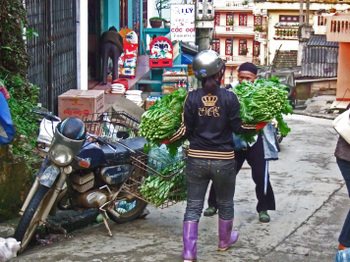 Walking around Sapa Market in the morning, you could see the fresh vegetables arriving. 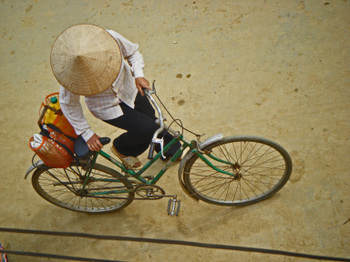 By motorbike and by foot. Up the steep hills from the green valleys below. 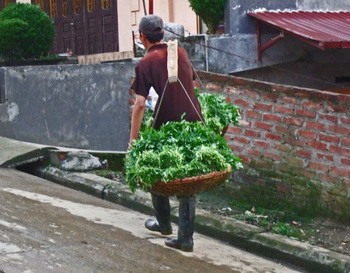 The slow procession of fresh, green produce made its way to the market. If this were San Diego, people would be going ga-ga over this stuff. 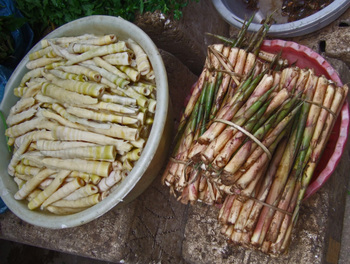 I found these very fresh young and tender bamboo shoots to be inspiring, as you will find out later on in this post. 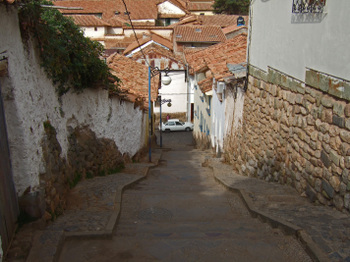 And though I found many similarities to the steep climbs we had in Cusco. 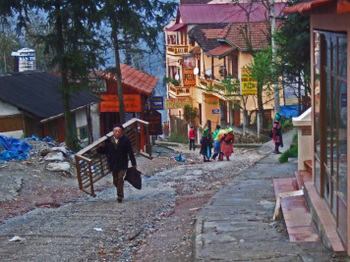 I never saw anything like this old man carrying a bed frame up the hill from Cat Cat Village! I noticed something very interesting at Sapa Market. 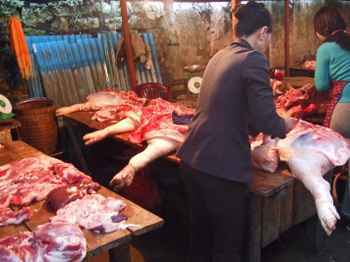 All the butchers were women, and they worked with such skill and precision. You knew they were not to be trifled with. 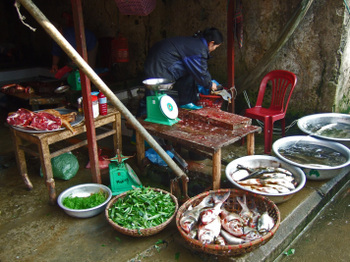 There was only one or two vendors selling fish. 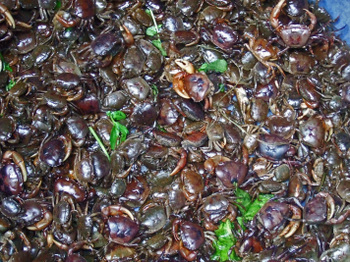 But I managed to snap this photo of some very alive Rice Paddy Crabs, since I know they have many fans in the States. 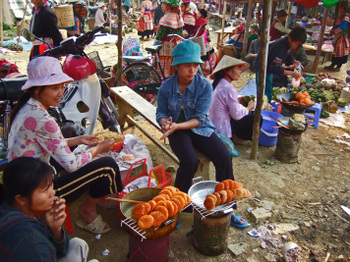 Though we never found a bowl of Bun Rieu in Sapa. Perhaps I wasn't looki ng hard enough. 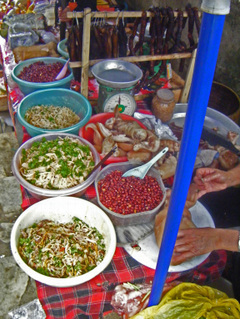 Later on in the day, the area around the market steps comes alive with prepared food. 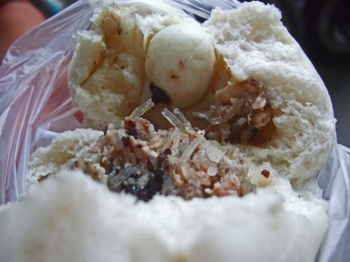 You can find Banh My, Banh Bao, and other snacks. One booth had long sausages coiled up, it was a nice variety to go along with the offerings from the "food court" in the center of the market. 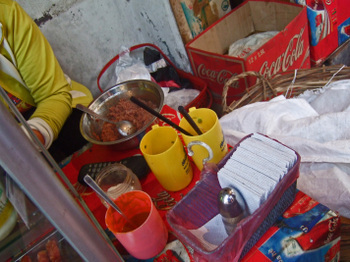 This booth had a variety of cut and shredded pork. 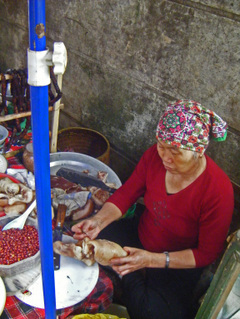 We watched this lady preparing and chopping pieces of pork into thin little strips. Until it hit us. 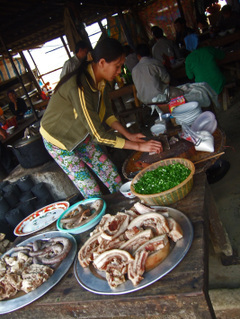 She was making Bi(pork skin and finely shredded pork) by hand! The item below is quite interesting. 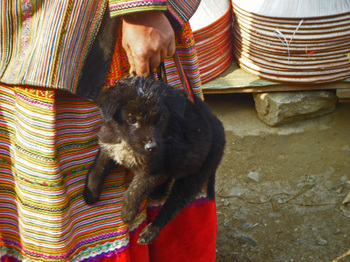 We had been told about it, but had never seen it until our last day in Sapa. H'mong Smoked Pork. 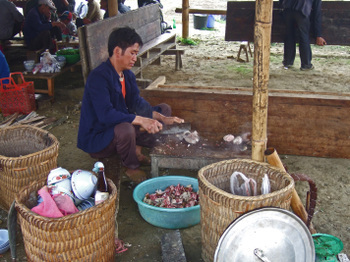 It's not very surprising that the H'mong smoke a good amount of meat, since it looked like many of the homes in the villages we visited lacked electricity, and thus refrigeration. Smoking is probably common practice as a means of preservation. Of course to some, this is just another day at the office. But to me, it was a wonderful melange of sounds, sights, and smells, that has been welded into my grey matter. 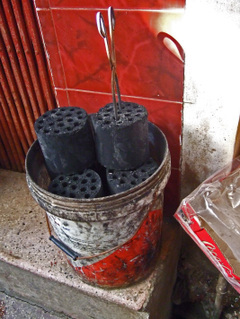 Even the little things, like the little coal cylinders used for the stoves. The Missus mentioned them as being part of Her childhood in Qingdao. 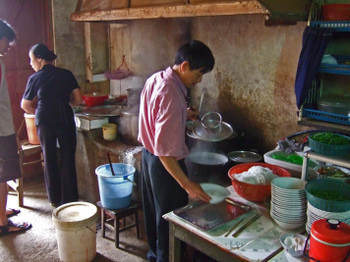 No central heating then, so the coal was used for the stoves, and the long lasting radiant heat for warming the family during the cold, Qingdao winter nights. Not to romanticize the whole thing, I'm quite happy with modern conveniences. But as a child of Hawaii, I am forever fascinated about these type of things. 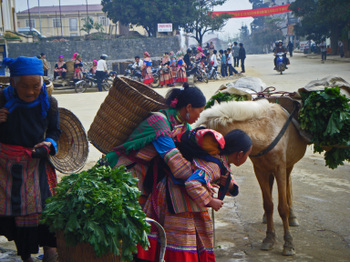 We returned to Sapa from our overnight trip to the Can Cau Market and Bac Ha feeling a bit tired. We wanted something a bit more comforatable than the rooms at the Mountain View Hotel. 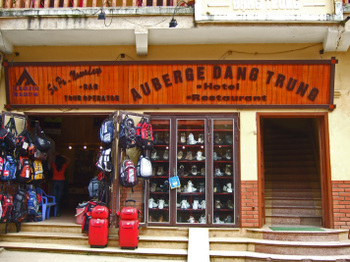 After checking out a few places, we decided that a back room at the Auberge Dang Trung would fulfill our needs. The price? 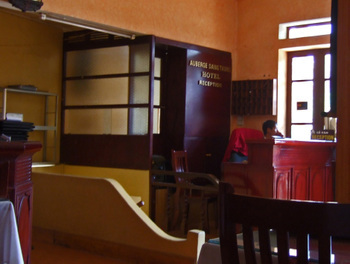 $18/US per night. The room we had was quiet, though it was a bit of a march up several flights of winding stairs, and through a raised courtyard. 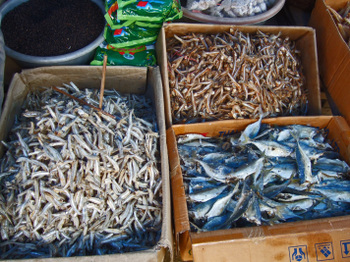 After stowing our stuff, the Missus and I were a bit hungry, but we weren't ready to face the hoards of hawkers on the streets trying to sell us stuff. 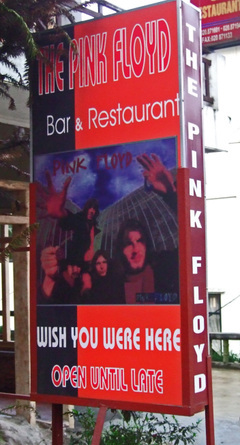 We decided to grab a bite at the hotel's restaurant/lobby/bar/tour office....or whatever you may want to call it. The Missus had one condition; "no more pork, or even meat for that matter." Say what? No meat? The menu was an interesting hodge-podge of almost everything. 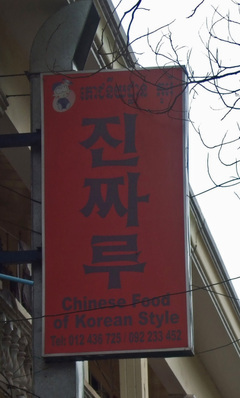 In fact, we noticed that many French tourists eat here. They all seemed to order the "ohme-let-te"; fried eggs with a baguette. 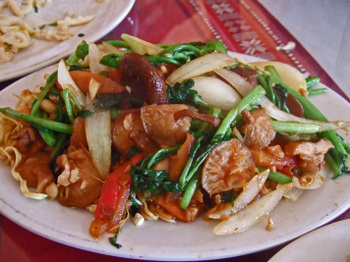 We started with the stir-fried vegetable of the day. 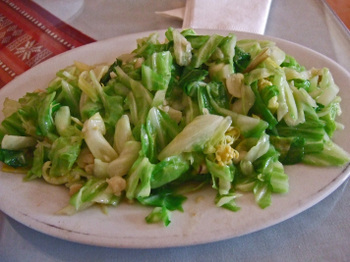 Which ended up being cabbage. Ehhh. But what should I have expected for 10,000 VND (less than $1)? 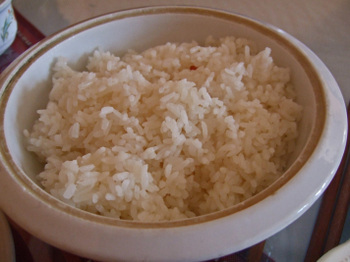 The rice was also typical of what we had in Vietnam, unpolished, off-white, with little gritty bits. I scoured the menu for something that I thought would be good. 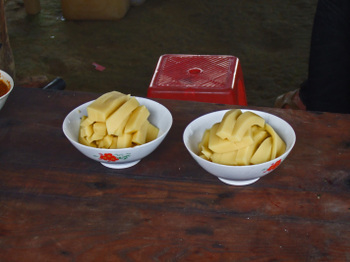 Having seen the lovely fresh bamboo shoots at the market, I ordered the stir fried version, in hopes that it would be fresh bamboo shoots ($15,000 VND - approx $1). And these delivered mightily. 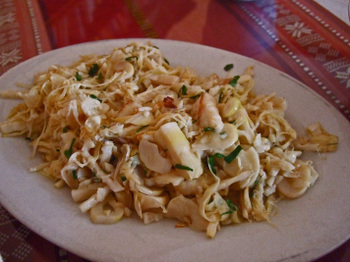 If you've never had fresh bamboo shoots, you're missing something good. The texture was a wonderful mild crunch, followed by an almost meaty bite. Simply seasoned with some decent quality soy sauce and black pepper, this hit the spot. 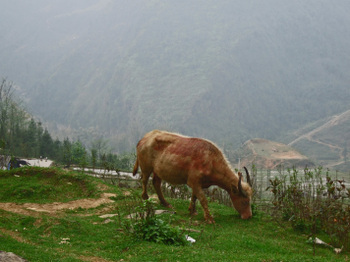 In fact, we made sure to have this again before we left Sapa. 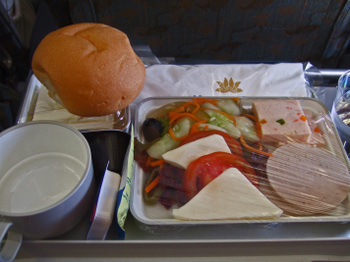 Not a bad meal for 50,000VND(a tad over $3/US). 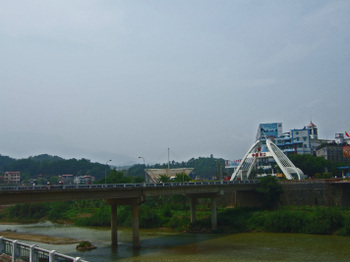 Here's a photo of the Vietnamese-China Border crossing from the town of Lao Cai, which is the dropping off point from the trains arriving from Hanoi to Sapa. 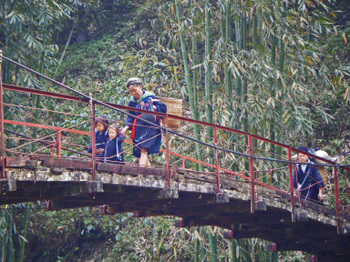 Crossing over the Red River via the Ho Kien Bridge and you'd be in the town of Hekou, Yunnan Province, PR China. Who told the Missus She should visit Hekou; "you don't need a visa, just sneak across the border, see, no problem, we do it all the time when we have visitors." Ummm, no thanks. 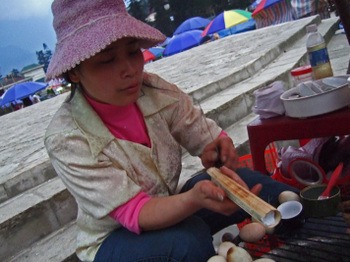 So what the heck does Hekou have to do with Com Lam and street food in Sapa? That'll become evident a bit later on. 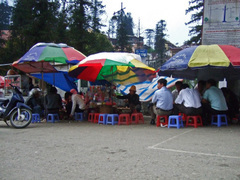 Street food is quite easy to find in Sapa. 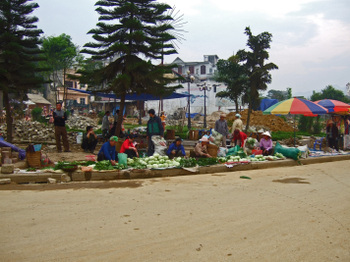 Little stalls and vendors line the streets around the Main Square. Actually, I'd be pretty generous in calling these stalls. 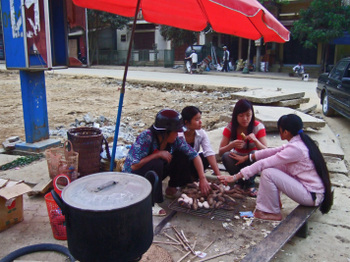 In most cases, the set-up consists of a few tiny stools, a grill, and maybe a plastic table. 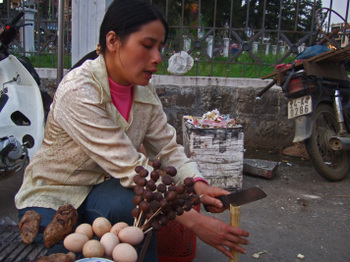 All of these little stands sell basically the same thing; grilled pork skewers, duck eggs, sweet potato, chestnuts, sometimes grilled sparrow...and Com Lam. 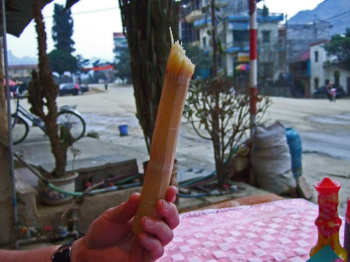 Com Lam is basically sticky rice cooked in tubes of bamboo. 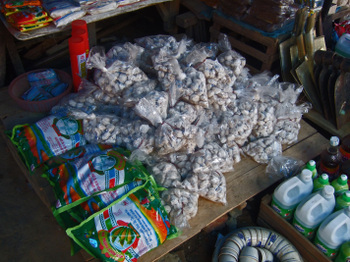 We were awestruck at the immense amount of these little stands....all selling the same thing. Who turned out to be Chinese, and originally from Hekou! Leave it to the Missus to find the only vendor in the whole area who is Chinese. The young lady was overjoyed when she found out the Missus is Chinese. 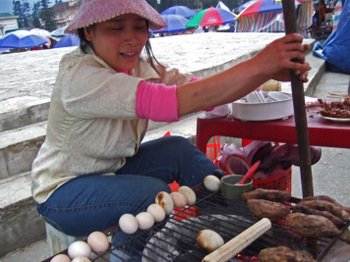 As she grilled our Com Lam, we learned her story. 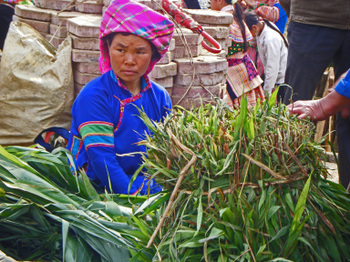 She was born and raised in Hekou, and ended up marrying a Vietnamese man from Sapa. 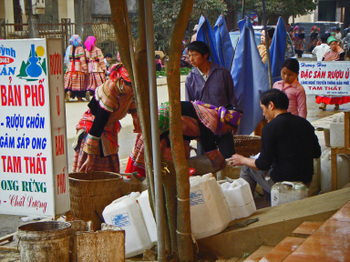 He was a schoolteacher by trade, and makes a decent amount of money, but it is not enough for the family of three(she has a 5 year old daughter) to make a decent living. In order to make ends meet, she mans this little stand 5-7 days a week, for up to 12 hours a day during the weekends. 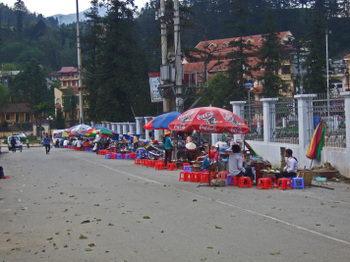 This was on our first evening in Sapa, and we could tell a storm was brewing. Several times the winds almost blew the umbrella off the stand, but the Missus helped her hold it in place. For some reason, it is one of my favorite photos. 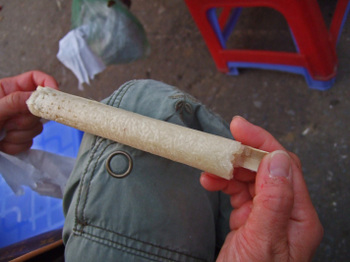 Soon after my little tube of sticky rice was ready; and with skill and precision(and a knife), the bamboo was peeled back to reveal the tube of rice within. The rice is chewy, and mildly nutty in flavor. 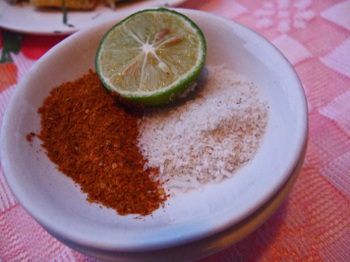 I really like the "dip" made of peanuts, salt, chilies, and a bit of sugar. 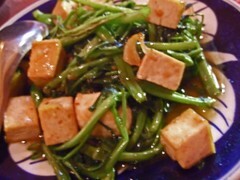 You can read more about Com Lam on Wandering Chopsticks blog, here and here on Oishii Eats. While the Missus was waiting for Her item to be ready, She learned a bit more about the young lady. 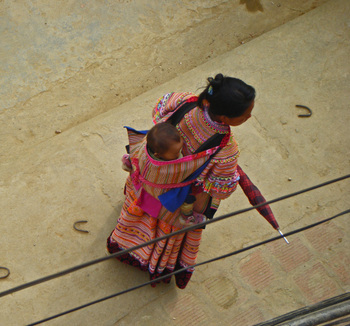 Her Mom who she tries to visit every month, still lives in Hekou. 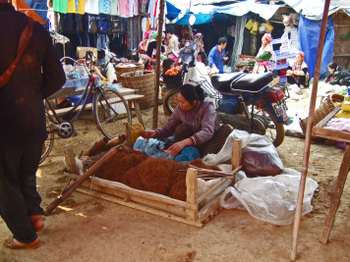 Her Vietnamese is not very good, which makes her kind of isolated among all the other vendors, though she has a few "friends". You could tell that the young woman missed speaking in Chinese. Can you see what the Missus is getting? 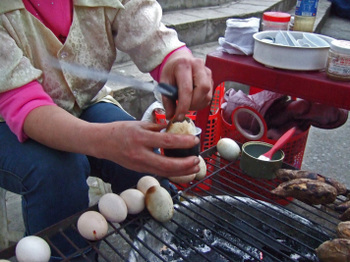 Yep, it's what they call Trung Vit Long...aka Balut. Something I've had before, but don't really seek out, and this version was way past it's "due date". Egad, I can't even describe it. Good fertilized eggs have a wonderful "juice" that tastes like the essence of the bird, this one didn't. 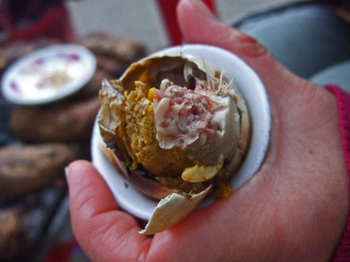 I've never seen Balut that already had feathers.......we couldn't make it past a mere taste. The Young lady though it was funny. At that point, the wind was whipping up, and it looked like the rain was on the way so we left. 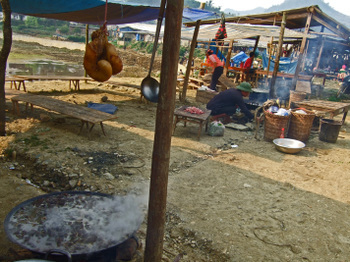 Knowing that the young woman was starving for some company that could understand her native language(the Missus told me the accent was sometimes very difficult to understand), we decided to drop by and grab a bite before leaving Sapa. 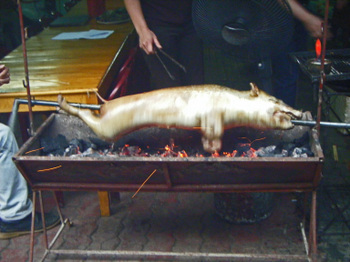 There is a large group of covered food stalls just North of the main square, and while walking through the booths we saw this, the "pig on a stick". 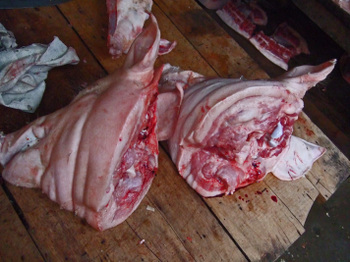 It was 240,000 VND a Kilo($15/US)....there was no way the Missus and I cou ld eat a kilo of pork meat. Somehow, we managed to let them know that we wanted a half-kilo. We chose some leg meat, and some back meat. It was pretty disappointing. 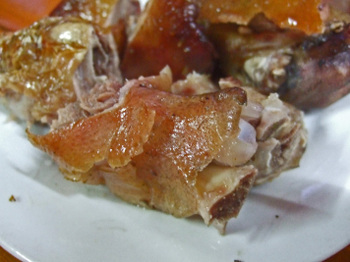 The skin, instead of being crisp, was more sticky and hard, and the pork had no flavor. Oh well, at least I got "pig on a stick!" One last thing. 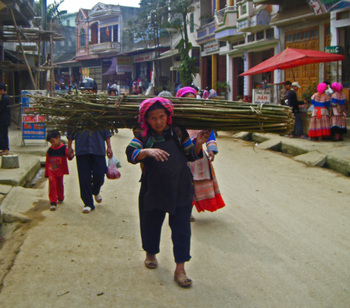 Here's your typical Sapa full service masseuse, barber, hair dresser, and most importantly ear cleaner. Ear cleaning must be a pretty big event, he's even got a spectator! 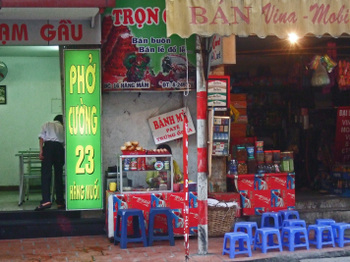 Yes, in Hanoi they spell it "Banh My", not Banh Mi. 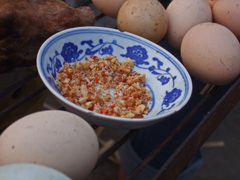 And most of the stands we came across only have 2 basic types; Banh My Pate(where you choose your meat), and Banh My Trung(egg). I had thought about not doing this post since I never managed to take a good photo of the Banh My in Hanoi, even though we had a few of them. 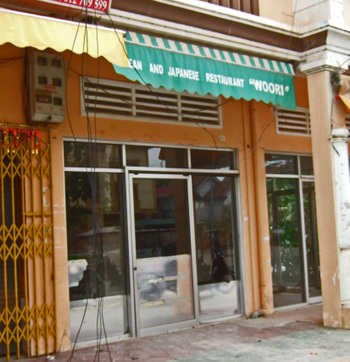 The best we had was from this little stand next to Pho Cuong on Hang Muoi Street. 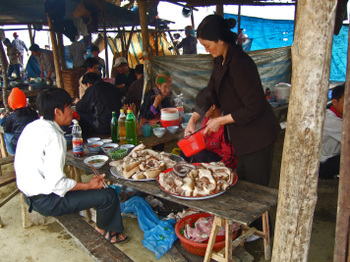 The drill, at least for us was pretty easy....you order a Banh My Pate, a Baguette is put into the little toaster tucked into the side of the stand, and the lady pointed at different meats. You nodded yes, or no to what you wanted. 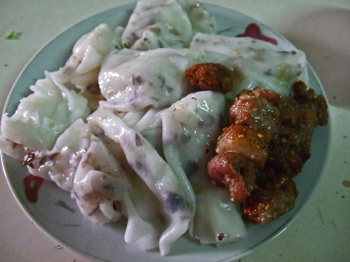 In this case the Cha Lua(lean pork sausage), and the Fatty Red Pork Sausage next to it. The Woman cuts a chunk of pate from the block, places it into a little pan, and heats it up to melt the pate. We usually decline the butter. 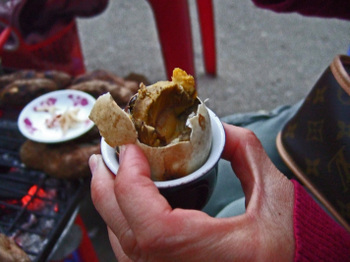 The Woman smears a good amount of pate on the warmed roll , adds the chopped meats, tops everything off with cilantro, wraps the sandwich in newspaper, bags the deal, and you're good to go. 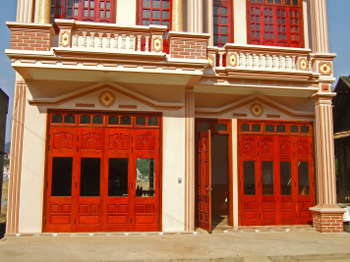 For 8,000 VND(50 cents US). So what's the difference between this, and what we get here in San Diego. Well first, I found the pate to be a bit creamier, and milder in flavor. It is quite good. The baguette is very light and airy. In fact, if you bit an end off, you could almost deflate the whole deal. It does have a bit of chew, and a nice light, yeasty flavor. The crust is thin and super flakey; the Missus said it explodes like a croissant. 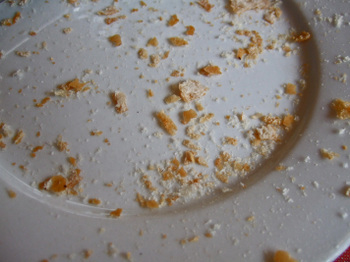 The crust is not hard and crusty...in other words, you won't tear the dermis off the roof of your mouth. 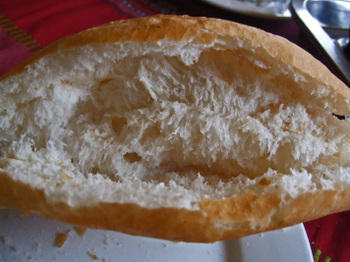 I've spoken to a few people who have been to Vietnam about the baguettes; and some of them are surprised I enjoyed the bread so much. They consider it cheap bread, without substance. I think of it as heavenly, both light and flakey. 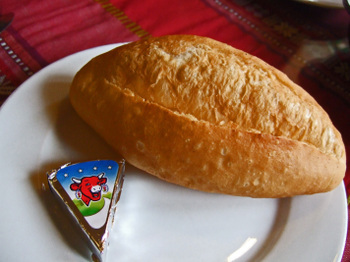 In fact, the Missus and I miss this type of baguette. Everything we've had since we returned has seemed too hard, not flakey enough, and much too doughy. 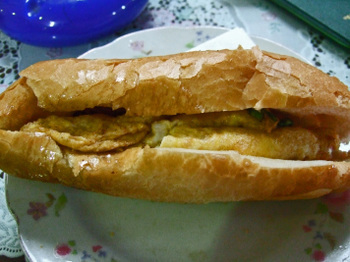 Here's an okay Banh Mi Trung. 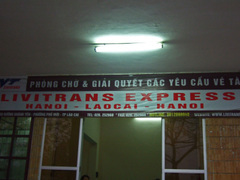 We had this at the Airport in Hanoi. Pretty greasy, too much butter, and the egg was oily. The baguette was the same though. 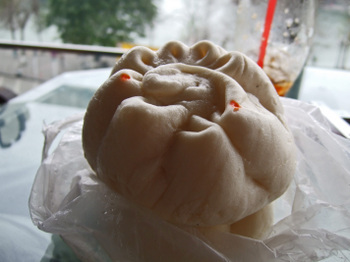 Classic, Chinese-style steamed bun. 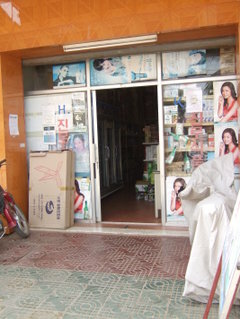 This one was bought on the corner of Duong Thanh and Bat Dan. It looked so good, so we stopped and asked the Woman how much it was. 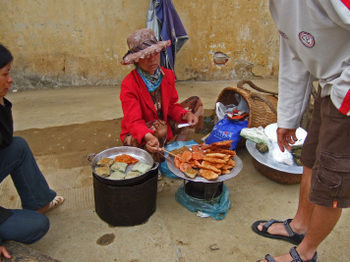 Unable to understand us, a young man eating on one of the stools told us 5,000 VND. Which was no problem. Except to this woman, who understood "5,000", and proceeded to give the guy a piece of her mind. 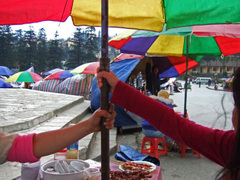 She than made the sign of "four"......we still gave her 5,000 VND, but being the honest vendor she was; she gave us change! You gotta love her honesty. The filling in these is an interesting mixture of pork, bean thread, and cloud ear fungus. And it is all topped off with a quail egg. It can be a bit on the greasy side. 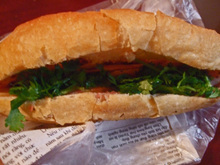 But, along with the Banh My, was really great for the train ride to Sapa. It will sit in your stomach for a looooong time. I was amazed to see a vendor carrying these around in her baskets. 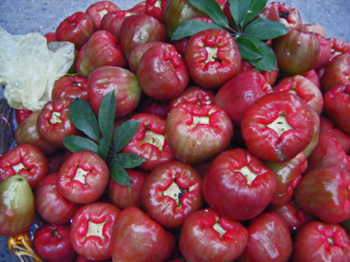 We called these Mountain Apples while growing up in Hawaii, but I now know they are more commonly called Malay Apples. I don't recall seeing them since I left the Islands. The Missus, never having tasted them, bought a few. And they were just as I remember, a bit tart, with crisp meat, and sometimes a mild bitter finish. Along with calling Iced Coffee with condensed milk Cafe Nau Da, instead of Cafe Sua Da, there's an interesting pronounciation for "R's". Ruou, is pronounced Zeee-ot, and Rieu Ze-ew. It didn't make much difference for us, because we butchered things pretty bad anyway. But it was made apparent when we inquired about things, and ended up spelling them. And we'd get; "oooh, Bun Ze-ew!" So just a few items I had waiting for the moment to post. I hope everyone is keeping cool this hot weekend! *** My apologies, this is another super long post. 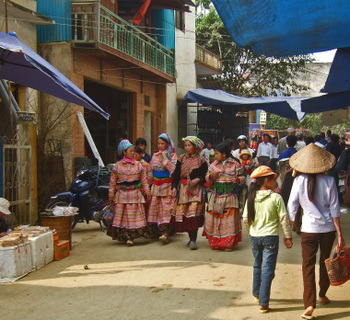 The Sunday Market in Bac Ha is considered to be the largest of it's kind in the mountainous region of Vietnam near the Chinese border. 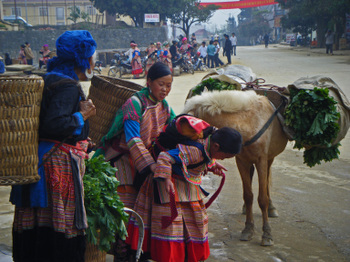 Most days, Bac Ha is little more than a sleepy, dusty, mountain village, with nary a horse drawn cart roaming the main streets. But on market Sunday, the place is alive, and you can feel the electricity in the air. 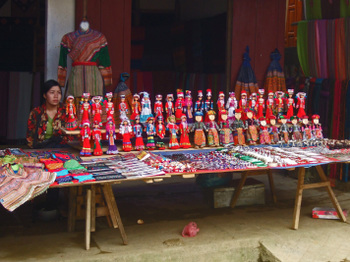 There were vendors everywhere selling all sorts of goods. Yesterday, what was a major construction area, was today filled with food stands. 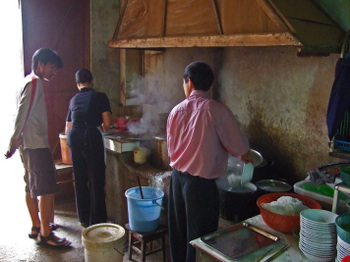 All of these were making different versions of Xoi Chien, fried sweet rice snacks. 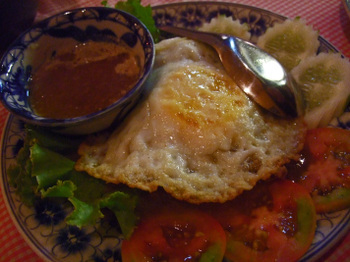 You can read about The Gastronomer's eating Xoi Chien here. 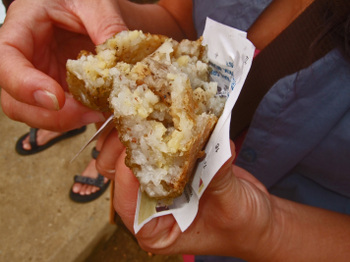 Chewy, mystery meat filled, greasy, fried sticky rice cakes about sums it up. 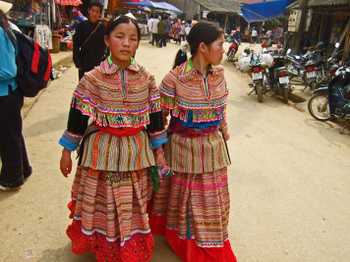 It really did seem that Bac Ha finds its "Glass Slippers" every Sunday, and is transformed into Cinderella. Or as the Missus would say, "more appropriately Yè Xiàn." 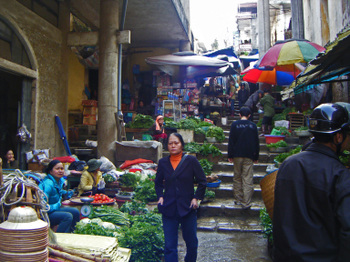 The main area of the market is a portable Fes-like maze of alleyways created by the various stands and vendors. There are areas I saw, which I considered even more ponderous than the cliffs of Pisac. 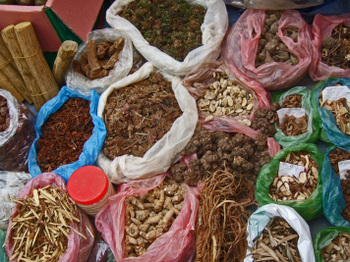 Here you can pick your poison; some Thuoc Lao for your nicotine fix. With free samples! 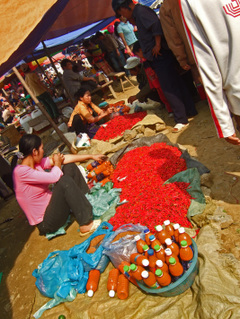 Or chilies, so fresh that smelling them can bring tears to your eyes, for those who think "red means go." Actually, these chilies have a nice heat, but also a sweet, fruity finish as well. Or maybe you need a cure for what ails you. 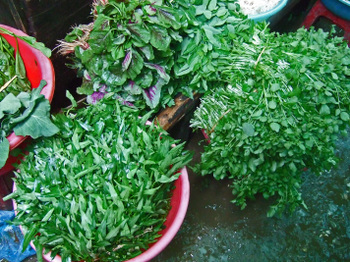 Herbs direct from China just a few kilometers away. Perhaps your Botox is wearing off, and you're in need of a "freshening up". Well, let me introduce you to the "not so latest thing". 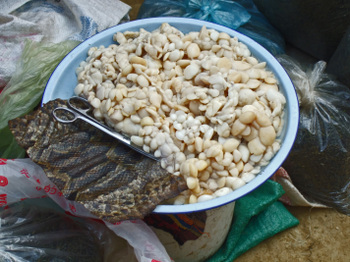 Maybe some Python Fat would be just what you need. 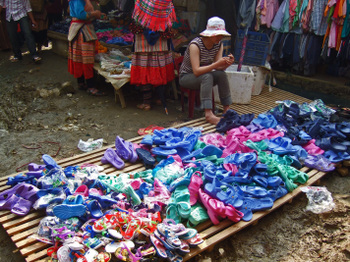 Perhaps you need to consummate that Vietnamese Plastic Slipper fetish you have, or maybe you're just channeling your inner Imelda Marcos. Well, they've a cure for that here as well. I know what, you're thinking; "why doesn't this idiot just stick with the food." Check out the fresh Bamboo Shoots. I picked one up(it was nice and heavy), took a whiff, and I swear I could hear the whistling of the wind through the leaves and feel the cool breeze on my face. 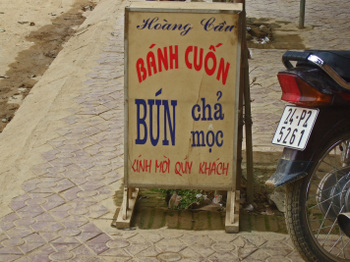 Thinh stopped by this little snack stand....I wonder why? 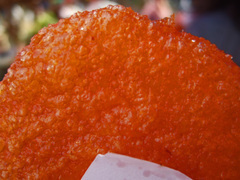 This fried sticky rice cake was so greasy, that it made the Xoi Chien seem like diet food. It was also tasteless; well unless you can tell me what the taste of cardboard is. Skirting the other fried food stands, we made our way to the market perimeter. This is where all the "real" food vendors are. 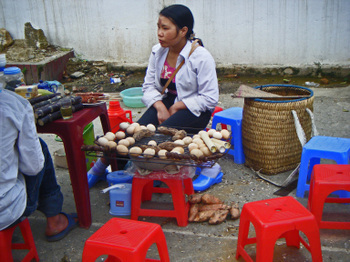 Just as in markets everywhere in Vietnam, Cambodia, and even Peru, all the prepared food vendors are organized by the type of food served. 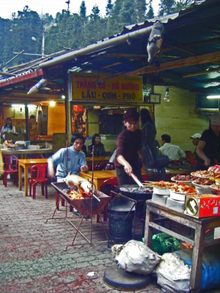 The largest section served up pork, pork, and more pork. 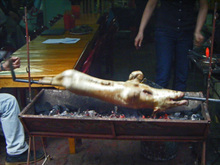 The pork was divided into different cuts(the belly looked really good), the ribs, skin, and even sausage was available. Another section was indicated by this. 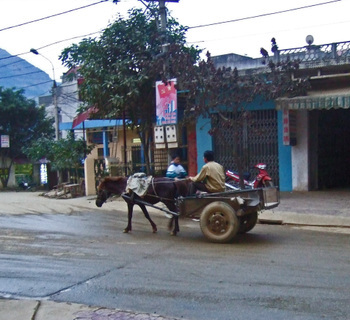 Apparently, that is the Vietnamese universal sign for Horse. 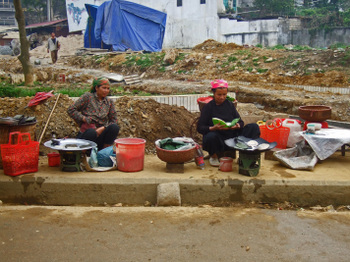 And the large woks and pots were bubbling away. Unfortunately(or maybe fortunately) for me, it wasn't ready to be served. 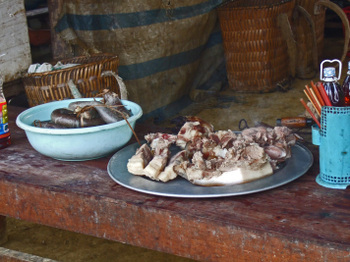 Further on is the area serving Tiết Canh, or fresh blood soup. I was told this was pork blood since everyone was afraid of bird flu, so duck blood is not being served. Now here's something you can help me with. 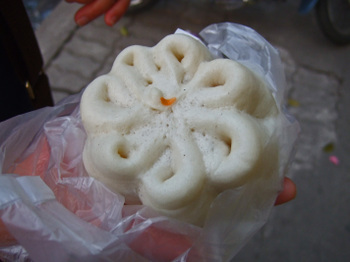 I asked Thinh what this was, and was told, "corn noodle". It looked like something created with a gelatinous thickener, and was cut from large blocks. As you can see, an interesting variety of food, and I'm sure I missed a lot. Compared to other markets, the meat section was rather small. As was the selection of fish and seafood, since we were quite far for any large bodies of water. 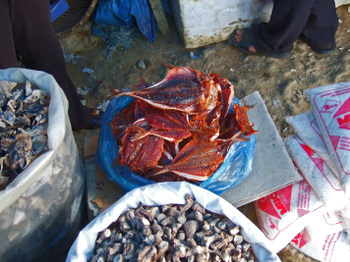 The selection of dried fish, though, was quite extensive. And all you need to find it is to use your nose. And just in case you want to try your hand at making Ruou Ngo(corn wine/spirit/hootch/moonshine - or literally "alcohol"), I was told that these are the "yeast cakes" used. So tell me, what do you think these 2 guys are doing? Comparing notes? Contemplating Ruou futures? Deciding what numbers to select for the Fantasy Five? In actuality, this was a fairly intense negotiation session. Over what you may ask? 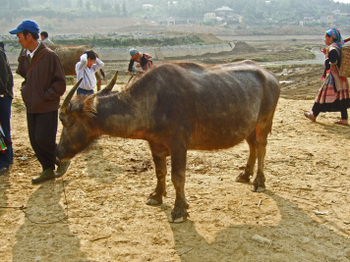 Meet our newest model Water Buffalo, comes with all the latest features, standard. 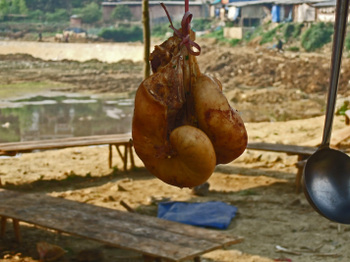 Does that look like 7,000,000 VND(approx $440/US) worth of Water Buffalo to you? In all seriousness, it has been a tough year. The long, cold winter has taken a toll on local livestock, and water buffalo are in demand. 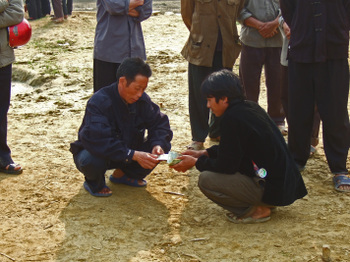 It was fascinating watching this transaction take place. Much of the conversation and negotiation is done very quietly. 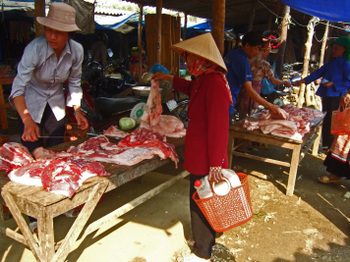 The livestock area at Bac Ha market is huge, and everything is being sold. From dogs of all ages(don't ask). 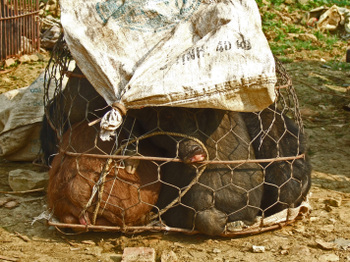 To pigs, carried in burlap bags, on leashes, and even stacked like firewood. By this time, the crowds were beginning to arrive, slogging the already cramped walkways. It was time to leave. 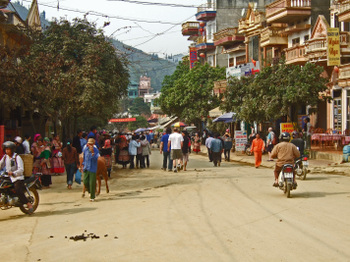 Bac Ha's main street was filled with motorbikes, buses of tourists, and people milling about. 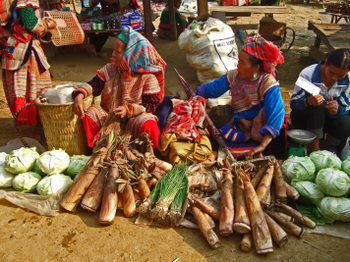 And while the market at Can Cau is smaller, and full of charm in a quaint kind of way; the market at Bac Ha is larger and much more intense. It is a sight to behold. And we were glad to have seen it this way. You see, in addition to the nice smooth asphalt that vehicles will be driving on soon, we walked through major construction on our way to the market. 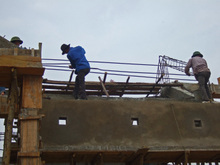 Once those buildings are completed, most of the market in Bac Ha will be moved indoors. So you'll be able to walk on nice clean and new concrete, past well marked signs, and look out over the new man-made lake. And feel positively civilized. 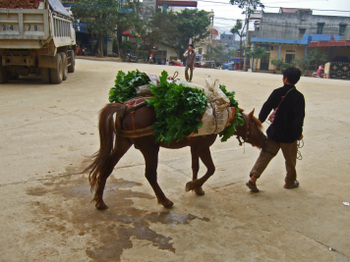 Yes, it seems that the Wild Stallion that is the market at Bac Ha will be tamed. It is just progress I guess. 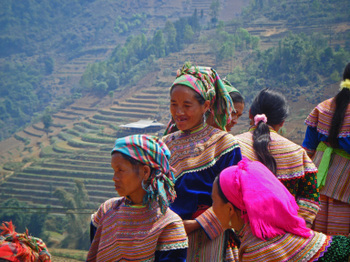 We were jarred awake from our Ruou fueled slumber by Vietnamese blaring from speakers mounted on the hill above Bac Ha. The Missus, rolling over, trying to escape the commands being issued, mumbled, "this is so Communist!" Having been raised in Qingdao, I'm sure She'd know. Raising my head, I noticed that the back door to our room was wide open! Instantly wide-awake, I started checking our belongings. After making sure that everything was in place, I'm guessing it was probably just the wind(? ), or maybe Obake? After washing my face, and brushing my teeth, I noticed that the Missus had walked out to the balcony, where She snapped a few photos of the people down below. It looked like everyone was on their way to Market. All together now, "Hi-ho, Hi-ho, it's off to market we go!" Not so fast. 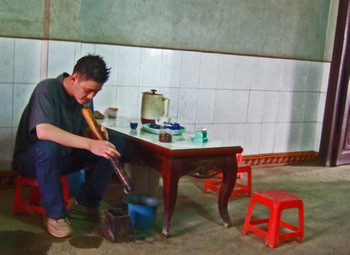 We met Thinh downstairs having tea, and he told us that things are just getting set-up. So why not grab some breakfast? Why not? 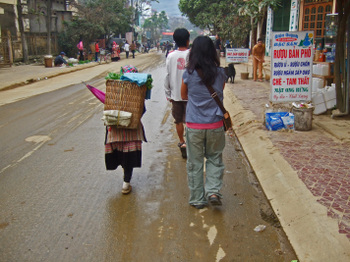 We walked past various people making their way to market. Oh, and what was being blasted from the speakers? 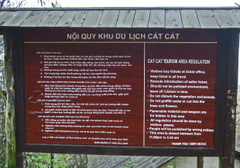 Thinh told us; "they are telling people to do their exercises!" The Missus turned to me and said; "see, I told you, this is soooooo Communist!" Watching this woman made my back hurt. I wanted to go over and help her, but she looked like she'd be able to body-slam me, and make me scream uncle, so I left her alone. 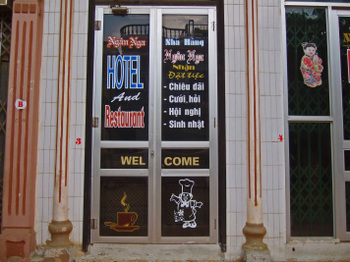 Thinh walked up to this doorway, took a peek inside, smiled, and walked in. So of course we followed, and found a Mom-and-Pop kitchen going full blast. One of the great things about these places is that you can get up close and personal with your food. 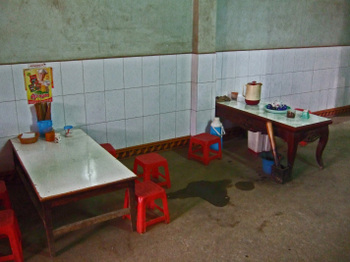 Of course the dining area included the standard kiddie stools and low tables(makes it easier to attain the squat-eating position), and even a communal Diếu Cày(bamboo smoking pipe), which I made sure to keep away from the Missus. This version of Banh Cuon had the least amount of filling of any we tried in Vietnam, but the "noodle" had a nice toothsome-elastic texture, and was not as "Sticky" as other versions. 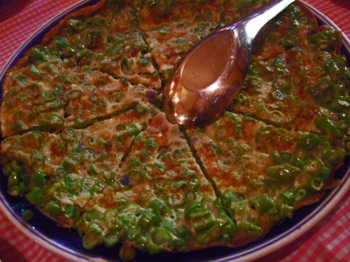 The Bun Cha, was on the chewy side, but the Nuoc Mam Cham(fish sauce based dip) added a nice savory touch. Overall, quite a filling breakfast. After breakfast, we found that we were still a bit too early for market. So we strolled over to Ngan Nga for some coffee. And just to "people watch". While this young lady was getting some help adjusting her little one, her pony was eating the profits! This Ruou Ngo(corn wine) vendor was doing some great business. 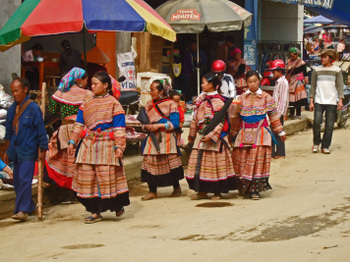 Even though the Bac Ha Market is off in another part of the village, you wouldn't be wrong if you said the entire village becomes a market on Sundays. 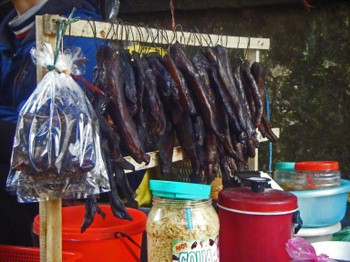 In every corner, every nook and cranny, is a stall or table selling something. Whether something for the tourist trade. 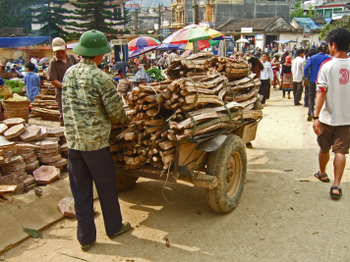 It was time to head to market. 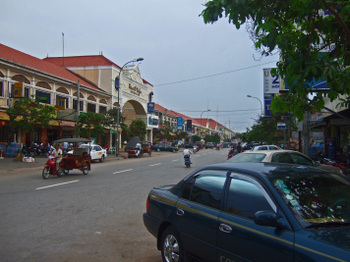 I was beat after boozing and eating it up at the Can Cau Market. 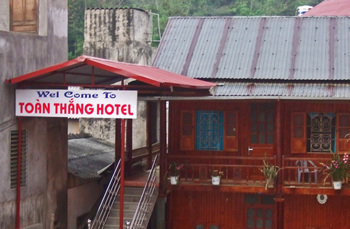 Returning to Bac Ha, I was ready for a nap as we arrived at our hotel for the night, Toan Thang Hotel. 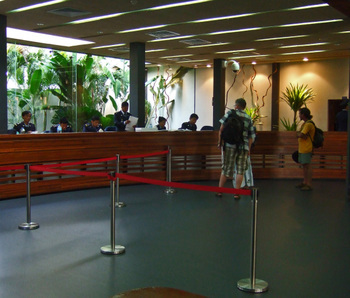 All of the hotels in the area have basically the same set-up, a multi-functional lobby area that is used as a combination check-in, lobby, restaurant, bar, and basic hang-out area. 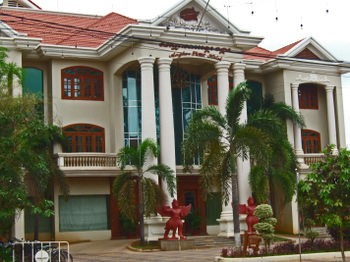 This hotel was interesting, there was an "old" wing, complete with corrugated metal roof, and a brand new building with a faux Euro-Asian design attached to it. 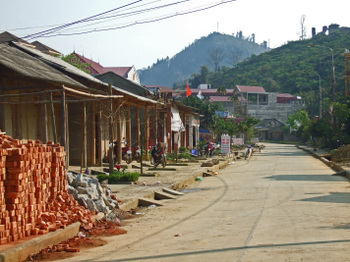 In a way, this was a perfect example of what we saw in Bac Ha, a village in transition, growing quickly, a convergence of the old and new. You'd as soon see a sleek, modern mini-bus and motorbikes(with the requisite horn honking) going in one direction, and this going in the other. 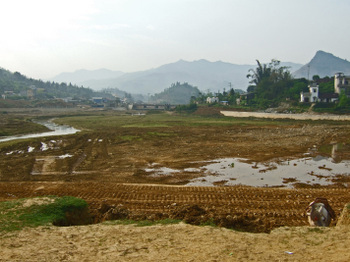 Some of the streets were just dirt paths, but right outside the city, major work was taking place. 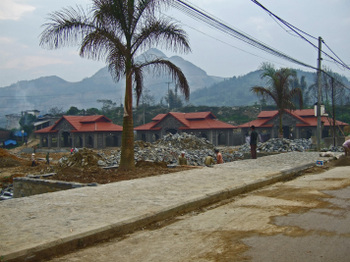 The roads were being widened, and fresh asphalt was being laid. Right across the street with the "old". 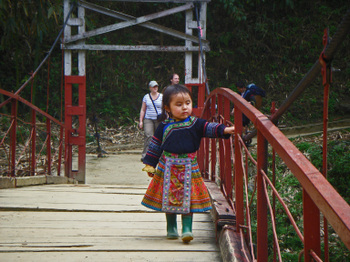 Yes, folks, Bac Ha is going places....where she stops? Nobody knows. I was fixed up in no time. 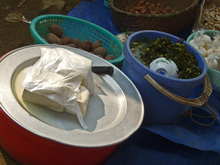 The pot contained sugar cane simmering in ginger water. The ginger had me back in no time. Yes, boys and girls, I hope you see the irony....I was cured by street food! 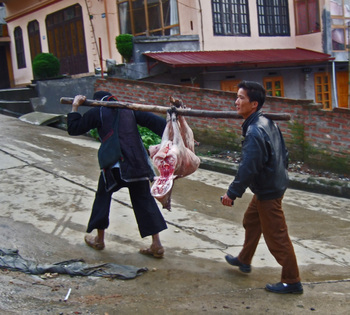 By the time we met Thinh for dinner, I was ready to go...no, not there...I was ready to eat. 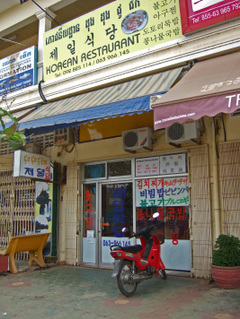 The restaurant selected was where we stopped for a break on our way to Can Cau Market the previous day. 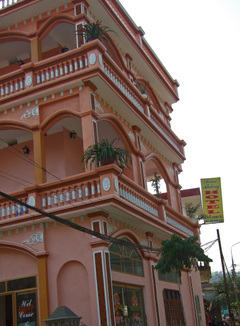 Like many of the places in Bac Ha, this was another Hotel/Restaurant. 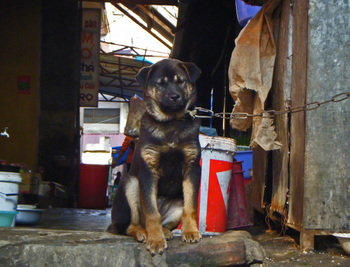 In this case, named Ngan Nga. We took a table outside and were handed menus. Going down the page I read, "omelet, Pho, fried noodle s, fried rice, french fries?" Say what! I didn't make a miraculous recovery from death's door to eat french fries! Thinh just laughed and said, "one minute, I'll order the food." 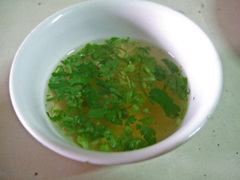 After a few minutes Thinh returned, and by that time, the Nuoc Mam Cham arrived, along with.......guess what? 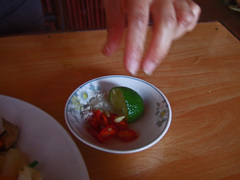 Salt&Pepper-Ground Chili(this one was really good)-Lime, of course. 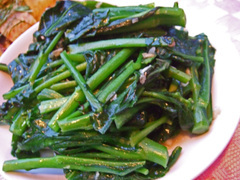 The first dish to arrive was a plate of blanched than sauteed Chinese Broccoli (Gailan), which I was told was called Cải Làn (pretty close) in these parts. It really wasn't anything we haven't had before, except that this version used both soy sauce and fish sauce. 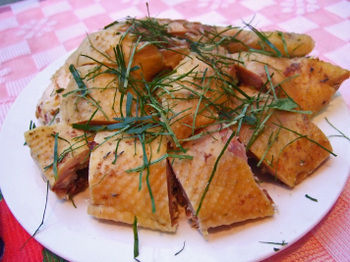 The next dish that arrived was a cold chicken dish. 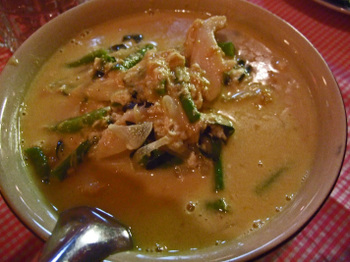 In this case the simmered chicken was chopped, and topped with thinly sliced kaffir lime leaves. As I enjoy cold chicken dishes much more than the Missus, I was fine with this. The chicken was on the chewy side, as wild, roaming chicken should be. The flavor was 100% true chicken; the lime leaves added a nice citrus-sour flavor, and a dip in the chili-lime-salt concoction helped out as well. 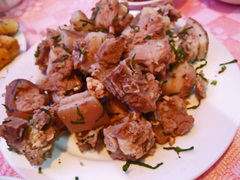 A plate of simmered pork arrived next, mildly flavored, and leaner than what w e had for lunch. The chopped pork was combined with a herb that had a basil-cilantro type flavor. Thinh wasn't able to tell us what was used. The Missus, still recovering from the pork at lunch, passed on this one. 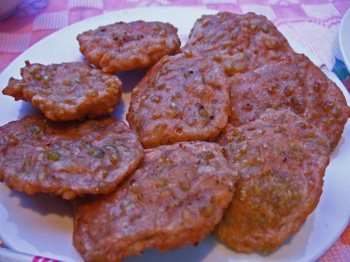 These are fried patties or fritters if you will, made with minced pork and green rice. Man, this was good! The pork added a nice richness as only pork can; the green rice added some crunch, along with a mild nutty sweetness. Oh man this was good. 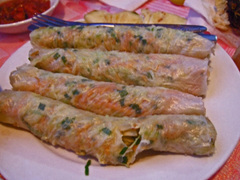 The last item was steamed, vegetable spring rolls, which we found to be on the bland side. Still, this was a pretty good meal. 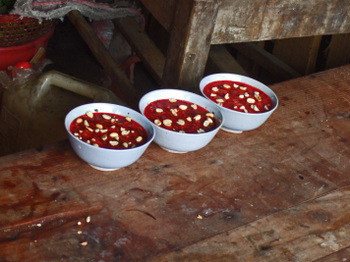 Of course, we had started in on the Ruou Nga(Corn wine). Which brings us on to the next part of the night. You know by now, that magical things happen when Ruou is in the picture. At the end of dinner, our driver Mr Thang made an appearance. Already hitting the Ruou with the other driver and guides(they all know each other), he kept apologizing. Of course, this meant an other refill of Ruou! Soon enough, the other drivers and guides drifted to our table, as if some unseen signal was being sent. And the Ruou was flowing! As the sun set, our loud and raucous laughter started drawing the attention of the tourists having dinner in the restaurant. But none of them wanted to have a drink with the "crazy Asians". It didn't help when Thinh actually lit a cup of Ruou with his lighter to show us "what it was made of". With tongues loosened by the corn wine(most of these guy weighed less than 50-55 kilos - it didn't take much), we started getting the "real dirt" on these normally serious and stoic drivers. 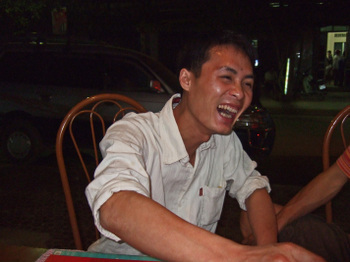 Thang, who was to married in a few weeks, met his wife to be when he almost ran her over. 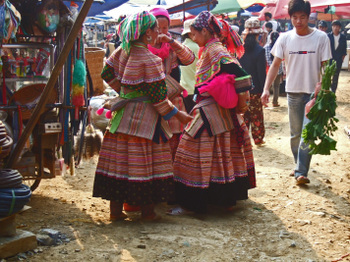 They got into an argument which continued when they later saw each other in Sapa later that day. 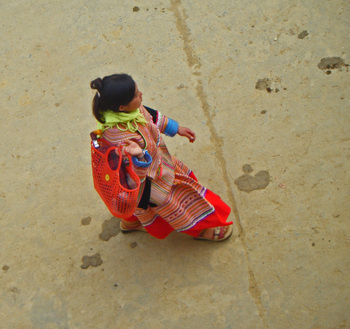 A few days later, Thang saw her teaching a class at a school....and was smitten, I guess it was love at third sight. 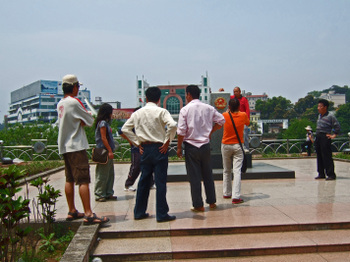 One of the guides, who was one of the larger Vietnamese guys I met at 75 kilos(guess my weight was a popular drinking game), was appropriately named the equivalent of "Hero" in Vietnamese, and enjoyed flexing his muscles, Hulk Hogan style. It seems that drinking with a female was foreign to these guys; this manifested itself in some fairly strange and humorous ways. Several times, the Guys raised their hands and asked the Missus, "madam, may I go to the WC(water closet)?" Ruou fueled regression? And then came the high lite of the evening. One of the drivers told us he had three wives! You read that right; three wives! 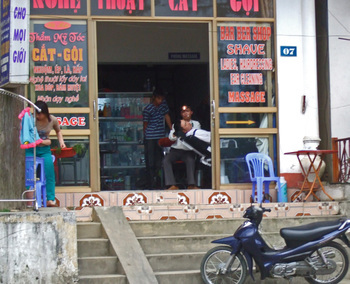 Thinh was beside himself, almost rolling on the ground. He'd known this driver for several years, and didn't know the guy had three wives. 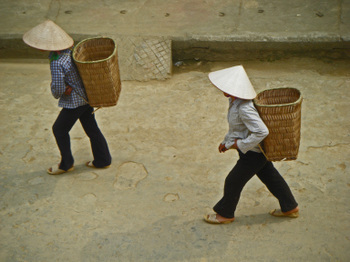 And no, polygamy isn't legal in Vietnam. Apparently, he has a bus route that takes him to some far flung villages, and so things just kinda happened(yeah right). All was well now, for they all knew about each other....they even get together and go out to dinner once in a while(I'd love to see that)! No wonder this guy was so skinny! Since this story couldn't be topped, we decided to call it a night. It was fun seeing this bunch of guys hanging out, and acting, well...like any group of young men. Some things are universal. Our dinner, and at least 4 refills of Ruou ran 220,000 VND( a bit less than $14/US). 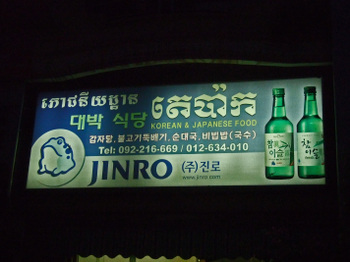 We staggered our way back to the hotel, where we were greeted by the Owners and staff, who asked us to have dinner, and (of course) some Ruou with them. I went upstairs and shared the last of the snake wine, and we had a few toasts before calling it a night. And we needed to get up early in the morning!